Lost in College what do I want to be when I grow up??? I don't know about you, but I had a #$%^&* of a time getting my first job!! Because I feel so sorry for the black kids in Oakland who are much further "behind the 8 ball" than I was when having so much trouble getting my 1st job. My mother wanted me to get an early start on school life, so got permission that I go to kindergarten a year earlier than normally allowed. That meant that I was the chronologically youngest person in my class all through K-12, and starting college. So, I was present in my "peer" group, but except for some other retards, not part of my "peer" group. OK - so life ain't fair - what is new? At least I was of the majority (and socially approved) race and of normal form, intelligence and appearance (except for size, the braces on my teeth, and glasses on my eyes). I was raised (grew up?) in a town where the police were confident of at least a polite greeting in all parts. There were no "affordable" apartment houses where police were afraid to park on the street outside or afraid to enter the apartment complex in groups smaller than 4. No fireman (they were all robust males) was insulted or assaulted. Our neighborhood was not "affluent" - our back neighbor, the butcher definitely had difficulty making ends meet. My parents provided a stable if somewhat imperfect (in my eyes) home where doing homework was definitely encouraged. My parents read fun stories to us when we were young. (TV was not available until years later.) My parents and their friends were respected and only visited jail ;-)) My father and his friends had regular jobs. My mother got us to church and tried to get us believe. Our only known drug problem was a (temporary) neighbor who occasionally mixed Benzedrine and alcohol and wound up locked out and crawling on his lawn. He lost his house and family before he became a police problem. In summary, I grew up in an ideal environment compared to many today. BUT - still had a terrible time getting my first job. - including getting a first job and some "jingle in my jeans". (My father wanted his kids to "know the meaning of money" and kept us kids pretty much impoverished - if you behave up to his standard (seeming too high for me 90% of the time) you can have a dime or quarter a week. I applied for jobs, and applied, and applied - but who wants an under age looking kid with poor social skills, poor mechanical skills, who never had "a real job". The owner of the repair garage where my father parked the family car in snowy weather gave me a chance at helping him with his parts inventory - but I didn't "get it" and was released after an hour, unpaid. One summer I got work picking ripe tomatoes at a near by farm. One of the other workers was a girl bully, who threw clots of dirt at me, and said that if I came to work the next day she would beat me up. - I didn't want to get a bloody nose and didn't go back. My father knew someone in county highway repair who said to meet him at a given intersection at 7:30 in the morning - I was there, he wasn't - he said I wasn't - and it soon became evident that my father's friend did not want to say "no" and did it this way. I met two "losers" who said that if I supplied gas money and food money they would take me up to Duluth (150 miles north) and we could get jobs building the Air Force base. Away to the north, to the Air Force construction site. we went - The construction foreman took a look at the two losers and me, the geeky kid, - and you could see "NO" written all over his face - but he went through the motions. "Have you ever operated heavy equipment?" "Have you ever held a regular job?" - and we were out the door. We lived at the YMCA (seemingly the cheapest lodging) and tried to get work at other places in Duluth. In a week our money was gone and we almost had to hitch-hike back home. Then I went to college and 50% supported myself cleaning dorm toilets until I was fired after about a year for trying shortcuts (waxing the tile floors so I didn't have to scrub them every day). - what do I want to be when I grow up???? The result was "Play Ground Supervisor"
After 4 years at the University of Minnesota, I got tired of drifting, purposelessly, and quit. The family on the annual vacation visited cousins in Montana. VeraLouise and husband were on an oil lease near Ferdig, Montana (like a part time store/bar and a post office in someone's home. VeraLouise had 8 kids and said if I helped "baby sit" I could live in a spare room and she arranged a job for me as a "handy man" at Ray German's machine shop in near by "Four Corners" - even smaller than Ferdig. I "worked" at a machine shop (handy man/boy) for six months, got draft notice (Korean War). Actually, this saved me from being fired. The machine shop owner and I were agreeing that my mind was more into electrical stuff than mechanical stuff - and that I not a good machinist apprentice. With the draft notice in my hand, I enlisted for three years in Army to get a 1 year techie school and nicer techie job. Edna (my U. of M. girlfriend) had checked with me when I dropped out of school - by the time I checked again with her, after a year in the Army, she was already married to some engineering student and had a kid. She said she had waited a while, but hadn't heard further from me, and had to get on with her life. :-(( bumber!! Got out of Army after the three year enlistment was up. In February 1957 I was discharged (honorably) from the Army. I knew I was a hot stuff techie, and that civilian electronic techie companies were just waiting for me to show up at their front doors. We Army techies had been telling ourselves that for years!!! OH - yes - that - Hmmmm - Well, it is March - not a good time to re-start in college - I guess I oughta getta job - yes. So I looked at the want-ads in the paper and Remington Rand Univac was hiring in Minneapolis, a reasonable commute from home in Stillwater - GREAT - I'll get a job there. So I show up for a job and am given a test for electronic techies. It was simple, I figured I aced the test. The tester gave it back, some marked up in red, and said I FAILED !!! What?? failed that simple test??? Yes, not enough correct answers - and he was kind enough to discuss the faults with me. But this answer is correct !!! The voltage gain of a cathode follower is not 1, it is slightly less than one, see here, and I could derive the formula for the gain of a cathode follower, which was slightly less than one. The tester said that the answer sheet said the answer was 1. And there were sufficient similar "errors" that I failed the test - and could not take it again for say 6 months. That was my first serious brush with "Human Resources", Dilbert is so right on !!! I was devastated, this super techie was rejected because he did not fit the techie mold!! The US was going to great pains to show that we were peaceful, by building civilian rockets with low vertical acceleration (launch acceleration) as opposed to war rockets which were supposed to have much higher launch acceleration. Yup - that was the theory of the time - now seems odd. It maybe that the demand for marginal launch thrust was the cause for the first Vanguard rocket later to be such a spectacular fiery crash on launch, in front of the world's TV cameras December 6, 1957 two months after the Russian Sputnik (launched 4 October 1957) had set us back in amazement. First assignment was to be a techie in the HIG gyro ( also here) area. Minneapolis Honeywell had the contract to supply fancy gyros to the American Vanguard rocket program. 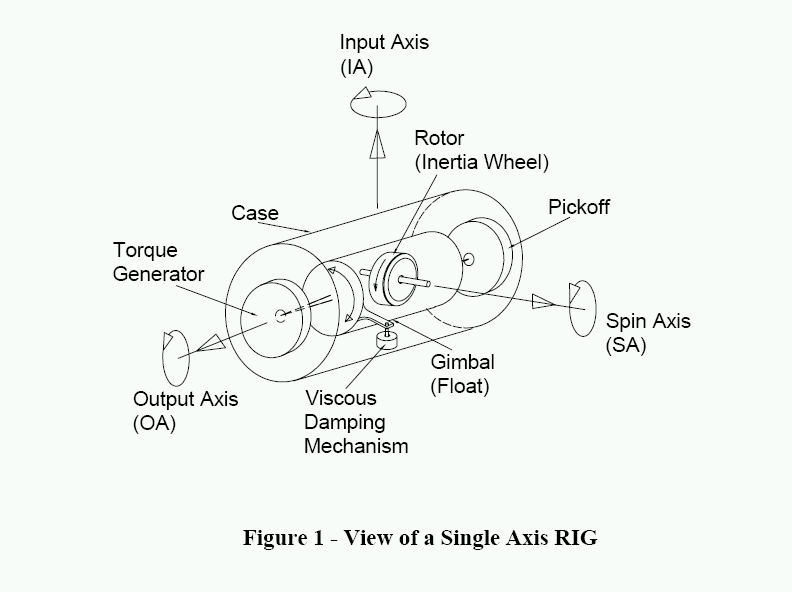 reduce the unbalance torque due to imperfect balance of the internal gyro can as a result of imperfect manufacturing. reduce the effective weight to reduce the bearing friction. Do the best you can in manufacture, and reduce any residual imperfections using the HIG design. so there were tricky adjustments in the fluid and temperature to get and keep things as close to perfection as possible. The drift of the above techniques was good enough so that the gyros were calibrated by mounting them on our rotating earth (which rotated one revolution once a day, relative to our sun - 1/365.25 off relative to the other stars) and referenced to true north which was a narrow red line painted on the floor, walls and ceiling of the test room. Verry low drift, very precise !!!! very careful !!! 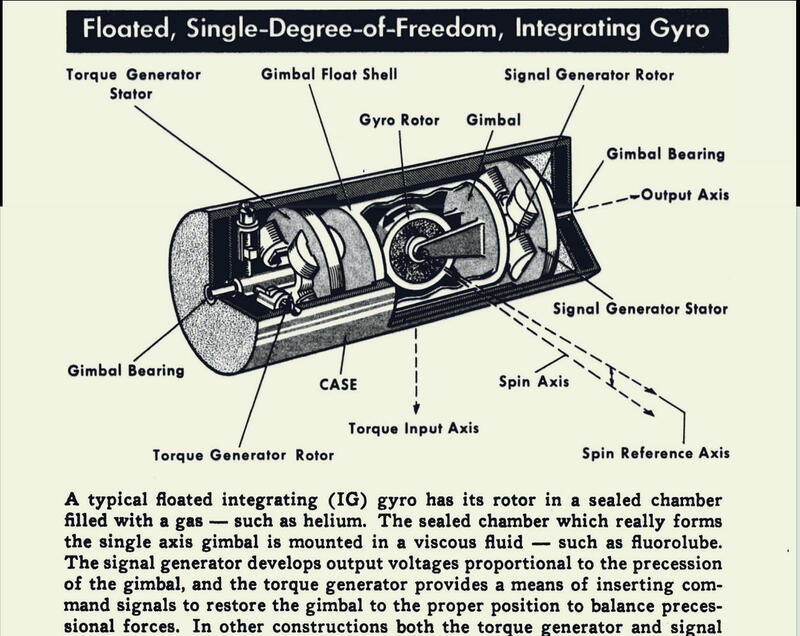 The cylindrical can containing each gyro was about 7 inches high, and 3 inches diameter, with a machined ridge around the center. The machined ridge had a machined rectangular notch to aid alignment in mounting. There was a sealed place for a wire bundle to come out to a plug for driving the gyro, driving the heater, and for the sensing signal. Sorry about the above complexity !! Did I say I was a super techie?? Soon I notice that the temperature servos (which controlled a variable transformer (VARIAC), which controlled the electric heaters in the gyro cans) were NOT "hunting", you know, a little up or a little down, like your automobile cruise control moving your accelerator up and down trying to make your car go at some precise speed - instead, ALL of the servo systems were driving ALL of the VARIACs in one direction or another ALL of the time. This indicated to me that the desired temperature was not reached - ALL of them were either too hot or too cool. Being completely clueless and/or careless politically, I tried to point this out. It seemed so simple to me - I complain to the guy who was trying to show me my work. He explained that everything is correct "they are under servo control". I as adamant - the servo systems were continually driving in one direction - there is a big problem here!! Soon I was explaining my idea to the supervisor. "Nonsense!! Everything is OK". I was glad that I was not fired!!! GADS - wouldn't that be something - self proclaimed super techie couldn't get a job on his own, then fired after a couple of days from techie job gotten by family connections. We tested engineering experiments and a sampling of production, (to assure that production testing was adequate). Vibration testing was a big kick. Two foot diameter shake tables mounted on coils, similar to giant speakers, driven by special motor generator sets. ElectroMechanical test objects wiggle, give odd electrical outputs, (and sometimes break) in ways you would never imagine !!! One of my many adventures was working near a graduate (degree unknown) of the Massachusetts Institute of Technology. By comparison, the fellow makes Dilbert seem an outgoing chatterbox . The story was that he was brilliant but with no practical experience, hence near us techies. His assignment was to gain practical experience by designing and constructing a test fixture. (A device to help test some other device.) The result was lots of wires between here and there, and switches, relays and indicator lamps. The box was metal, 19 inches wide to fit into a standard 19 inch rack, and maybe 5 inches high. The test fixture was finished, and now to test the actual test fixture. Our hero plugged the new test fixture into the lab wall socket - and smoke came belching out. Among other things, our hero had neglected to design in protective fuses. Many/most of the internal (plastic coated) wires had melted and charred. The box was called a total loss. But, our hero was now judged to have gained practical experience and disappeared up-stairs to join the regular engineers. Another tale from the same time and place. Another techie nearby had a plaque hanging over his work bench. Many names were on the plaque, including the name of the lab manager. I asked my fellow techie what outstanding thing he had done to have the plaque hanging over his bench, with his name on the list. He looked at me sideways and said that was a circulating Boo-Boo award. He had screwed up at least $50 worth of equipment, and he would be happy if I did the same so the plaque would be hung above my bench instead of his. I even got to design an electrical chassis that would aid our testing. Two brothers in another department fabricated my design. Folks told me that if I complained about their work, my car would be damaged in the parking lot. Fortunately everything was OK, actually looked very good. OH YES - there was a Union. The guys in the tool crib were in the Union. According to standard procedures, if we were working with a rate gyro, and wanted to test it, we were supposed to take it to the tool crib, have them log it in, and at their pleasure they would take the rate gyro to the test area (and not tell us when the gyro was in the test area). And sometimes the gyros seemed damaged when they were handled by the tool room guys. This was a big pain and bother. The tool crib was way out of the way, the test area was right next door to our desks. And the tool crib guys were unfriendly and uncooperative. so we just stuck the gyros in our pockets, went to the test area and took out the gyros to test them. The tool crib guys bitched that we were doing them out of some of their work. We got a lecture and promised to use the tool room guys to carry our little gyros to the test area - and we continued doing what we wanted - The tool room guys gave up on us. In any case, there was lots of chance for over-time and I was saving most of my pennies. Speaking of pennies - I don't remember was I was making - but we complained that the engineers on the floor above were getting a whopping $5 per hour !! "Yeah - he is one of those $5/hour engineers !!!" So I applied to get back into the University of Minnesota, this time the Engineering Department. Yes - I wanted to be an ENGINEER and get that big $5/hr salary. At that time there was a big push to get more women into engineering school and engineering. The engineering college dean said that yes, they would admit me, - did I know any girls interesting in becoming engineering students. I didn't - but tried to mumble some encouraging words to stay on his good side. I spent a year as an electrical engineering student at the University of Minnesota - very theoretical - no practical. I wanted some practical also - the world is at least partly practical. Remembered friend at Honeywell and headed for the Milwaukee School of Engineering - getting in for the summer session. I Really LIKED Milwaukee School of Engineering (MSOE) !! They let me play in the labs, unsupervised ( I really didn't do any serious damage - scared myself a few times ). - called a friend at the University of Minnesota to see if I could borrow his car. By Saturday morning I was in Minneapolis, with a car, picking up my girl friend. By Saturday noon we were in a secluded place, I was on one knee - proposing. After engineering college, with computers and the race to the moon blooming, good interesting jobs were as available as cherries in harvest season. A common practice was to have a backup job offer in your back pocket in case your boss got too obnoxious. - what a time - too bad the current crop of engineers is having so much challenge/competition.